Gandhigiri has been subject of discussion, in every nook and corner of the country. Lage Raho Munnabhai has revitalized the Gandhian school of thought with a fresh perspective. I have never seen Mahatma Gandhi so visible in India, before this movie except for the currency notes. The real essence of existence of Bapu was not in politics but in his philosophy of life. The movie has brought to the people of this country to understand path for the great Indian dream to evolve. The magi c of the Bapu and his school of thought is so phenomenal that one gets overwhelmed by the wonders that can be achieved by simplicity. It is good to read that people actually in my city are giving roses to the signal skippers. But I feel that there is another important part which people have forgotten and need to be reminded. 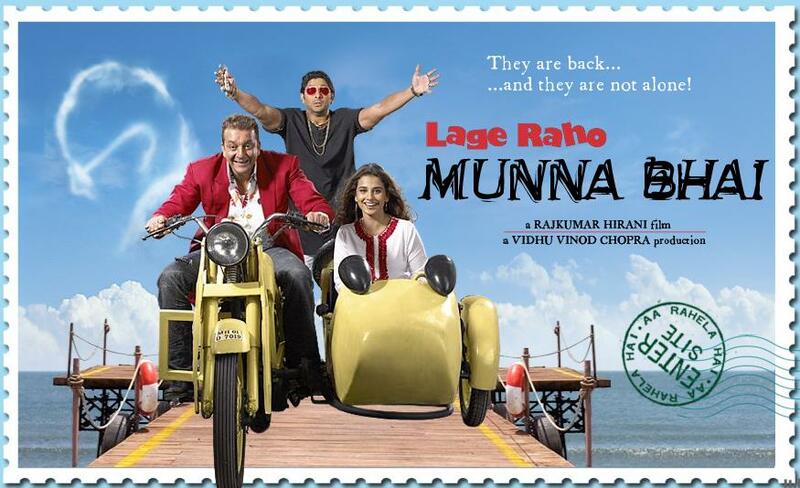 There is a common thread that links the two Munnabhai flicks together. The thread that we realize and feel in our heart. The thread of humanity, the thread of coexistence. Both of these flicks depict of things common man is forgoing; those basic values, the little pleasures of life. The ‘Satya’, ‘Ahimsa’ ‘Jadoo ki Jhappi’ attributes like these are not unknown to the people. It’s just that he is letting them go in the struggle of life, chasing the larger than life kind of dreams and paying for those dreams in reality. Though Gandhigiri rules through out the movie but I believe a fair amount of credit should also go to this little poem which starts the movie at exactly the right note. Shehar ki is daud mein daud ke karna kya hai……..
Agar yehi jeena hai dosto…… to phir marna kya hai…. ?? Paheli barish me train late hone ki fikr hai…..
Bhul gaye… bhigte hue tahelna kya hai……!! Serials ke kirdaro ka saara haal hai malum…. par MAA ka haal puchne ki fursat kaha hai….!! Ab ret pe nange pao tahelte kyu nahi……. 108 hai channel par dil bahelte kyu nahi…..!! Lekin pados me kaun rehta hai jaante tak nahi……!! Mobile,landline sab ki bharmaar hai…. lekin jigri dost tak pahuche aise taar kaha hai….!! Kab dubte hue suraj ko dekha tha yaad hai…..?? Kab jaana tha shaam ka gujarna kya hai…..?? to dosto Shehar ki is daud mein daud ke karna kya hai……. agar yehi jeena hai……. to phir Marna kya hai…????? I loved that movie! and I hv always been a fan of Bapu. totally agree with the insight man….it is so sad but equally true we have forgotten ways to coexist and priciples of humanity….its quite appreciable in the mr.vidhu vinod chopra depicts this through simple yet powerfull avatars of love for others…. munna bhai!! !..humourous but sensible…Strong but emotional..different yet very very common….he is flavour of the day…and so is our own gandhigiri…reminding us that we need to pause and think that things won’t last forever..so, better we stop chasing illusions and start living our lives ..nice thoughts dear and i love those 16 lines because every single one of them is true for each one of us….